After suggesting this past weekend that a tango between heavyweight king Stipe Miocic (pictured) and light heavyweight champ Daniel Cormier might be intriguing, White has managed to quickly arrange the champion vs. champion scrap. The two will collide July 7 at UFC 226 in Las Vegas. T-Mobile Arena will most likely serve as host. The announcement was made Friday at the UFC on FOX 27 weigh-ins. Miocic became the UFC’s most decorated heavyweight champ this past Saturday by posting his third consecutive title defense when he dominated Francis Ngannou at UFC 220. There were rumblings earlier today that the UFC was finally renegotiating a new contract with Miocic, something the full time fireman has rightfully been requesting for quite some time. No word if both sides were able to come to terms, but it’s likely given how quickly this fight materialized. 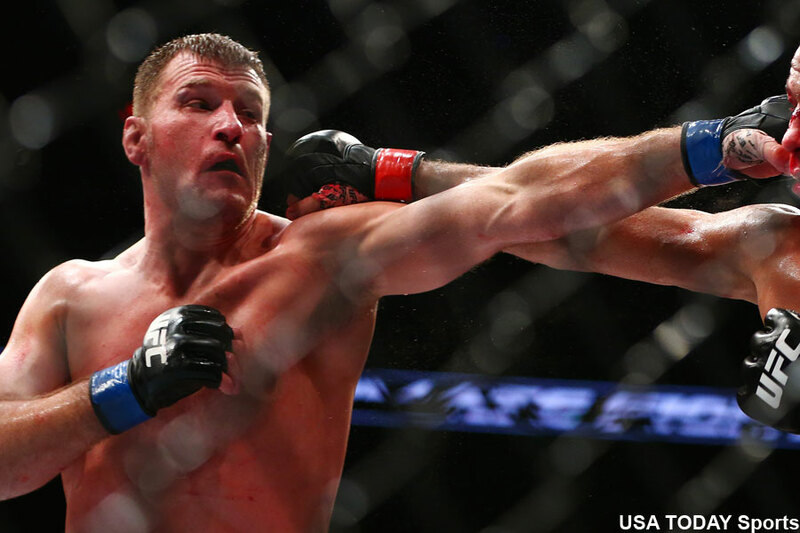 Miocic has rattled off six consecutive victories, with the last three being of the title defense variety. Cormier, who throttled Volkan Oezdemir right before Miocic took center stage at UFC 222, will be competing at heavyweight for the first time since beating Roy Nelson in October 2013. The former Strikeforce Heavyweight Grand Prix champ decided to drop to light heavyweight after the bout so AKA teammate Cain Velasquez can dominate the UFC heavyweight division. However, Velasquez hasn’t been seen since TKO’ing Travis Browne in July 2016. While it appears the former UFC heavyweight champion might slowly be inching closer towards a return, he won’t be challenging for the throne anytime soon – most certainly not while Cormier is champion if he beats Miocic. Cormier revealed this week that he plans on retiring from MMA before he turns 40 in March 2019. Cormier and Velasquez have long vowed never to fight each other, so don’t get your hopes up for some AKA on AKA crime.